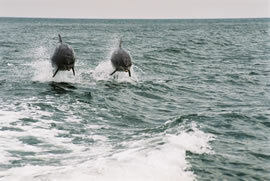 The CRRU bottlenose dolphin project first began in July 1997. 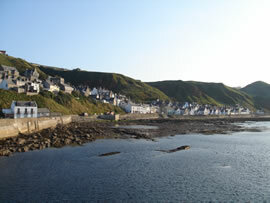 The picturesque village of Gardenstown. Home of the CRRU team. 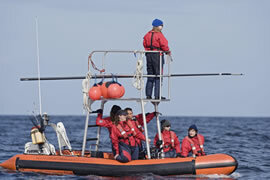 The team at work, surveying for cetaceans at sea. The recovery of a harbour porpoise that had been attacked by bottlenose. Preparing the research boats for a day out at sea. The Cetacean Research Unit was first set-up in 1997 during a former mark-recapture study of the bottlenose dolphins in Spey Bay – a large, shallow bay adjacent to the proposed Special Area of Conservation in the outer southern Moray Firth. As word spread and the reputation of the early project work grew, more and more people became involved in the research proper and subsequently the need to formally constitute the organisation was realised. Initially set-up as an unincorporated voluntary group, the small team of marine researchers and environmentalists soon recognised the need to expand their studies to a wider geographical area in order to better understand the movements and habitat use of the transient dolphin community being studied. This was largely achieved through platforms of opportunity (sailing, fishing boats and whale watching vessels). 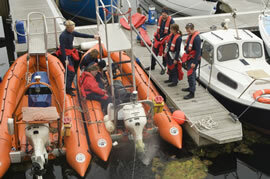 Then in 2000, two 8 metre ex-life rafts were donated to the organisation for their studies. At this time, the team had also been responding to a number of call-outs to stranded cetaceans along the north east coastline. But in 1999, a call was received to a live-stranded porpoise, which subsequently identified the need for a regional strandings / veterinary division to address such situations in the future. The name of the organisation subsequently became the Cetacean Research (& Rescue) Unit (CRRU). The CRRU team relocated to the picturesque heritage fishing village of Gardenstown in early 2000 where new office and accommodation facilities were installed. The liferafts were sold to provide funds for the groups first Rigid Inflatable Boat, Orca II, and a grassroots award from Transco subsequently equipped the team with its first 4 x 4 vehicle / wildlife rescue ambulance. The first university dissertations were provided for students in 2001, and these were largely supported with funding from the summer research training programme in association with Ecovolunteer and Ecocorps Scotland. During the following 5 years, the CRRU provided student placements, volunteer and field training opportunities for in excess of 200 folk. In addition, the CRRU was instrumental in setting up a national strandings network for Scotland with British Divers Marine Life Rescue. 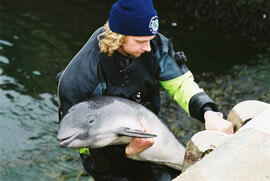 From 2002 to 2006, over 500 volunteers were trained in marine mammal rescue treatments and procedures. In 2004, the CRRU became formally recognised as a Scottish Charity, and in 2006 major funding was received in support of the charities ongoing research programme. The CRRU currently provides placements for up to 60 international volunteers and students a year, and boasts an impressive publication list and educational outreach programme. The field base in Gardenstown operates from May to October each yea, although sister projects currently also operate in southwest Thailand and along the Ionian coast in Greece. For our full list of research publications, click HERE.